How media report on troops firing on protesters when it’s an official enemy doing the firing (New York Times, 3/25/11). The fig leaf of “clashes” is not needed in reporting on US enemies. 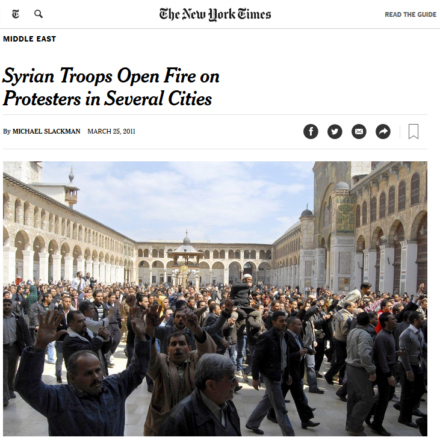 In 2011, Western headlines routinely described Libya’s Moammar Gaddafi and Syria’s Bashar al-Assad as having “fired on protesters” (e.g., Guardian, 2/20/11; New York Times, 3/25/11). Simple plain English works when reporting on those in bad standing with the US national security establishment, but for allies of the United States, the push for false parity requires increasingly absurd euphemisms to mask what’s really going on—in this case, the long-distance slaughter of unarmed human beings. Israel has a state-of-the-art military: F35s, Sa’ar corvettes, Merkava tanks and Hellfire missiles, not to mention the most intrusive surveillance apparatus in the world; total control over the air, sea and land. In the Great March of Return protests, the Palestinians have employed rocks, tires and, according to the IDF, the occasional Molotov cocktail, though no independent evidence has emerged of the latter being used. 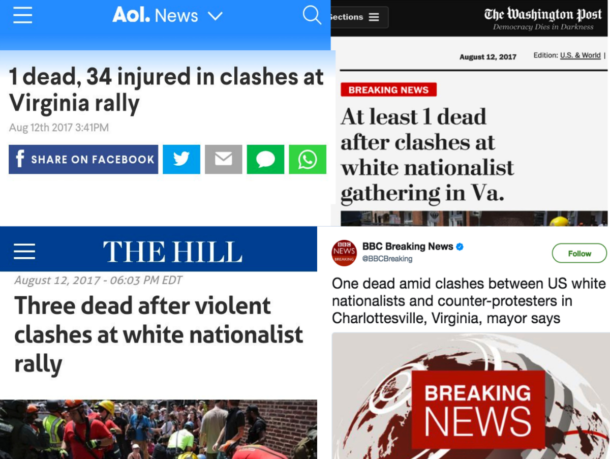 The power asymmetry is one of the largest of any conflict in the world, yet Western media still cling on an institutional level to a “cycle of violence” frame, with “both sides” depicted as two equal parties. The term “clashes” permits them to do this in perpetuity, no matter how one-sided the violence becomes. An excellent and essential post. Thank you. I’m glad to see any decent person’s hero, George Galloway, featured so searingly and passionately in opposition to the criminally psychotic Zionist monster. I’m at a loss. I see the disparity between Palestinians and Israeli’s as pointed out in this article and agree, and its terrible to be sure. Admittedly, I know very little about all this and I’m heartbroken over the loss of Palestinian lives. So outrage is the appropriate order today. Conversely I want to think the Israeli’s are a peaceful people in a virtual impossible position. Am I naive? Are we erroneously assuming the people are in charge? on both sides? Even without knowing much about this, I KNEW our head idiot was poking a stick at a fire when “he” moved the embassy. Are Jewish people (who I assume are the “Israeli’s”) and Palestinian people (who I assume are “Muslim”?) destined to be locked in a perpetual unwinnable conflict? Any “Readers Digest” comment would be helpful…. You are indeed naïve. Let’s have a 24-hours-or-so luncheon date and I’ll un-naïve you. Note for starters: Palestinians include both Muslims and Christians. You might try to get a head start on our luncheon by searching for “Sabeel Ecumenical Liberation Theology Center” or “Kairos Palestine.” Also peruse the tireless, essential Alison Weir’s voluminous “IfAmericansKnew” website (the url ends with .org).